After my post about Conference Sunday and our activity of tutu making, I've gotten a couple of requests to explain how to make them... so here goes. It is super easy- otherwise I wouldn't be able to do it. 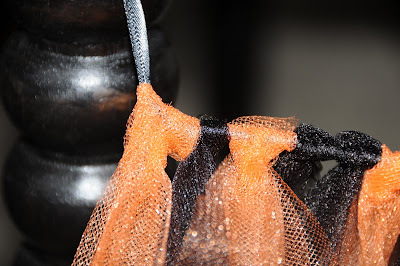 You will need 3-4 yards of tulle- depending on how full you want it. (PS- Walmart has it for 97 cents to 1.19 for the shiny). There are a few different kinds, I like the kind with the smallest holes, but the kind with the bigger holes is a little stiffer, so it adds a fun texture. Decide how long you want the tutu to be. 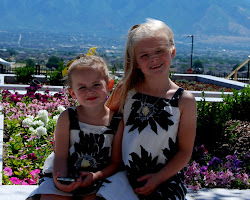 (Jade's tutu from Conference is about 14 inches long, Ivy's is 10 inches and the one below is about 6 inches long). Once you've decided how long- it's time to cut your tulle. 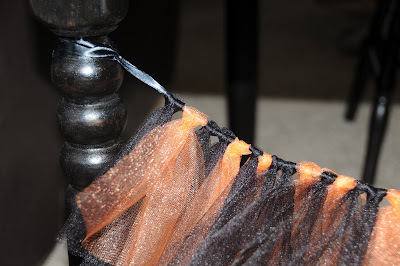 Cut the strips 4 inches wide and twice as long as you want the tutu. (The black and orange one is in 12 inch strips). Tie a ribbon across something so that you can work easily with the ribbon. (You can use elastic as well- but my girls wanted ribbon). Take the first strip, fold it in half. 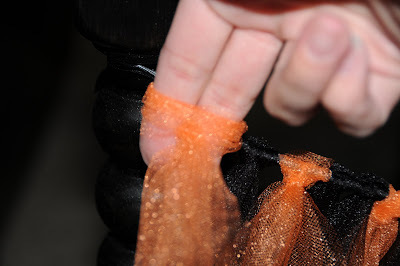 Then pull it around the ribbon and pull the ends through the loop. Pull it tight. Keep doing this and create a fun pattern. For the one below, I did two blacks, one orange and then two blacks. I'm debating adding a little bit of yellow. It's really easy and doesn't take very long at all. The girls have had fun with them and their big teddy bears are now wearing tutus.